George Carlin on Aging - Received this by email. 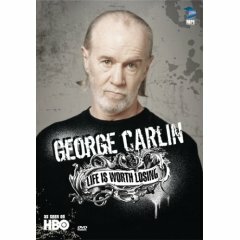 Totally hilarious and, as per George Carlin, so very insightful. Carlin's wisdom grows with age. Do you realize that the only time in our lives when we like to get old is when we're kids? If you're less than 10 years old, you're so excited about aging that you think in fractions. "How old are you?" "I'm four and a half!" You're never thirty-six and a half. You're four and a half, going on five! That's the key. You get into your teens, now they can't hold you back. You jump to the next number, or even a few ahead. "How old are you?" "I'm gonna be 16!" You could be 13, but hey, you're gonna be 16! And then the greatest day of your life . . . you become 21. Even the words sound like a ceremony . . . YOU BECOME 21. . . YEAS!!! Whoa! Put on the brakes, it's all slipping away. Before you know it, you REACH 50 . . . and your dreams are gone. You've built up so much speed that you HIT 70! After that it's a day-by-day thing; you HIT Wednesday! You get into your 80s and every day is a complete cycle; you HIT lunch; you TURN 4:30; you REACH bedtime. And it doesn't end there. Into the 90s, you start going backwards; "I was JUST 92." Then a strange thing happens. If you make it over 100, you become a little kid again. "I'm 100 and a half!" Throw out nonessential numbers. This includes age, weight and height. Let the doctor worry about them. That is why you pay him/her. Keep learning. Learn more about the computer, crafts, gardening, whatever. Never let the brain idle. " An idle mind is the devil's workshop." And the devil's name is Alzheimer's. The tears happen. Endure, grieve, and move on. The only person who is with us our entire life, is ourselves. Be ALIVE while you are alive. Surround yourself with what you love, whether it's family, friends, pets, keepsakes, music, plants, hobbies, whatever. Your home is your refuge. Don't take guilt trips. Take a trip to the mall, to the next county, to a foreign country, but NOT to where the guilt is.